Before Al Gore made global warming a political movement, I had a job to do and a sense of purpose. Fight global warming, save the planet. Now, were I to take up the topic, I would be merely redundant. Not that I'm complaining, mind you. Public acknowledgment of this issue is what we wanted. But there is a disorienting sense that the movement is no longer on my turf, that it has been handed over to bigger entities. When the threat of global warming was being hotly denied by conservatives and the science deemed controversial, it was my duty to bring it to the attention of everyone who would give me an ear. I could frame my stories as heroic journeys, as I personally threw myself into various adventures to reduce my carbon footprint, as if I alone could bring this immense threat to our blue planet to heal. I was entertained by the quixotic tone of my campaign while striving to inform and inspire others to join me. Now the floodgates have opened and more people are talking about global warming as an immediate threat that they, too, should do something about. Yahoo created a competition (sponsored by Ford Motors) to see which city, nationwide, could pledge itself to be the most green. My home base of San Carlos, not notable for anything more than being a pleasant suburban bedroom community of SUV driving soccer moms, is currently ranked second! Residents have pledged to replace light bulbs with compact fluorescents, turn down their thermostats in the winter and up in the summer. They will take shorter showers, buy energy efficient appliances, drive the speed limit and eat locally. Barbara Kingsolver's book "Animal, Vegetable, Miracle" about eating locally, has become an unexpected bestseller. Another writer has secured a book contract to describe how he and his family are managing to survive a year without toilet paper. Thoreau and his year at Walden is oft evoked. From my required reading of Walden in high school, I can surmise that Thoreau is something of an American archetype, embodying principles that Americans supposedly yearned for, even as they catapulted into a world that he so diligently warned them about. It intrigued me to learn that Thoreau, too, had a book contract before he headed off to his cabin. And therein lies my point. We are not really going to change anything. Not really. We are going to do our damndest to keep everything just the way it is, while embalming in books, the desire and need for fundamental change. Now that Al Gore has put global warming exactly where he wanted it, "on the tip of the tongue of every constituent" or at least a critical mass of them, the government can begin to talk about taking steps to regulate carbon emissions, while industry is scrambling like mad to save itself (and in turn capitalism) by making sure they can still continue record growth in the green economy. Here in the land of the Prius and the progressive, a coalition has been formed called Sustainable Silicon Valley. When I first heard the name a few years ago, I wanted to laugh. To think that this boom-bust, go-go economy of hyper achieving, workaholic, techno geeks could ever be sustainable seemed to illustrate the whole underlying conflict of interest of it all. Nevertheless, Catherine, who has become something of a poster child demonstrating what one person can do to affect change within the work environment, was asked to speak at their recent forum entitled "Climate Action Plans: Getting Started and Maintaining Progress". So being a supportive spouse, I found myself attending and tried my best to stay awake through the four speakers lined up ahead of her. The Sustainable Silicon Valley forum did offer me a healthy nap before I heard a speaker with something interesting to say. 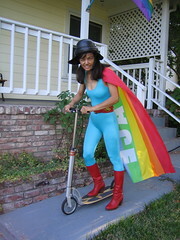 She was from Sun Microsystems. Sun had taken the next step in corporate responsibility by creating a program dedicated to the task of reducing their carbon footprint (while still maintaining their desired growth). This speaker was their Eco-Responsibility Program Manager. She unabashedly addressed the environmental problems of the high tech industry from e-waste and toxic chemicals, to energy use. Some datacenters use nearly half the capacity of an entire coal burning plant, she mentioned. Sun was making it their business to do something about it, with their new energy sipping servers and the mysterious Project Blackbox, a portable, water-cooled, datacenter built inside a shipping container. It uses 20% less energy and one-fifth the space of conventional datacenters and could conceivably be powered with on-site renewable energy. I am very fond of the Internet. It is possibly the only invention brought forth in my lifetime, beside the birth control pill, that offers such power to individuals. So I was relieved and encouraged that industry would be able to retrofit the hardware and allow the storage systems to be decentralized, while using less energy and space. The Internet is worth saving. I do not feel the same way about that other convention of modern life, the automobile. Yes, I have valiantly been a part of the effort to transition to cleaner cars. 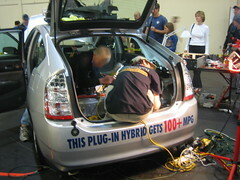 Last month, I once again staffed the booth for the plug-in Prius conversion demo at the Make Faire. I couldn't drive my Sparrow to the event because she has been in my mechanics garage for six months awaiting a new swing arm. So I decided to take my back up electric vehicle—my e-Go scooter. Half way there I picked up a pebble somehow and blew out the back tire. Trying not to ask myself why this happened on this particular day, I walked the hundred pound vehicle back home and got out my bicycle. (I could have driven my Honda wagon, but that wouldn't have been right especially since the fair was only five miles away.) 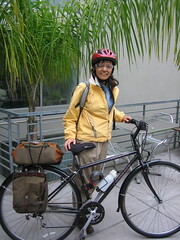 That my bicycle had become my most viable form of transportation impressed itself upon me that day. Yet, bicycling is still considered something best left to fanatics or the poor. It is becoming painful to watch the auto industry try to save itself. How can we justify turning a food source, such as corn, into fuel, thus raising the price of this staple for poor people in Mexico, simply to prop up our addiction to cars? And now there is talk of making coal into a fuel, thereby creating twice the global warming emissions of gasoline. I have already written about the idiocy of fuel cell cars and my vehicle of preference, the electric car still exacts a sizeable toll on resources in its manufacturing and does nothing about the problem of congestion. Cars have not given us the freedom we seek. They have entrapped us into spending more time driving and more time working in order to keep the beasts at our beck and call. They have made modern life extremely dangerous and our cities extremely ugly. They have allowed neighborhoods in my town to be built on top of hills with roads so steep and so poorly planned that only a highly powered car can get up them, thus cutting them off from low powered and human powered vehicles and even walking. During the Katrina catastrophe, I was fascinated by the multiple mile traffic jam of evacuees. There right before my eyes I could revel in all that was wrong with our automobile monopoly, as those who had cars, sat for hours imprisoned in the very vehicles that formerly represented personal freedom, locked in a standstill on a federally funded highway system in constant need of maintenance, while those who did not own cars were left to rot. This is exactly what happened in Bangkok. There my Thai peers look around at their concrete, paved over, modern city and realize that recreating L.A. was not quite what they had in mind. Where did they go wrong? Could it have been different? When my father was a boy, the canals had not yet been covered over for roads. A great deal of commerce and trade went by boat. This "floating market" that so charmed tourists is all but gone. Had Bangkok stayed with the mode of transport that gave it the moniker Venice of the East, it might today be a completely different city with a unique character all its own. Blame it on the royal family. They loved cars and gave Rolls Royces to each other for presents. (I suspect they also didn't learn to swim with all those peasant children playing and laughing in the water.) One king had a grand, European style boulevard built down the center of the city complete with monuments. It went nowhere, but it did give the royals a place to drive their cars. Meanwhile the ornate and splendid, hand carved royal skiffs were put in storage to be taken out once every century for centennial celebrations. Today boat buses are still a viable and pleasant transport on the river, but on land, ugly overpasses exact a toll from the rich to expedite travel, while in-town traffic crawls, and the expensive rapid transit will likely take decades to pay off, not to mention that the city's air pollution is ten times worse than a bad day in LA. Other cities, too, have made similar concessions to the automobile, most notably in China, rapidly replacing the bicycle, while here in California, we have taken for granted long daily commutes and suburban sprawl eating, like a blight, into farmland. Now that the environmental movement has gained a political toehold, it is not likely that we will be questioning the primacy of the automobile or any other unsustainable practices. I fear that, with Al Gore's earnest, mild mannered, mainstream brand of environmentalism, we have come to the gay marriage/gays in the military phase of the movement. We will use our political equity to fight to keep the institutions that enslave us, while leaving, by the wayside, the radical ideas that might actually change the way we live for the better. Longtime friends of mine are organizing a movement called Stop Everything Week, calling for a general strike—encouraging people to take a week off work between July 4th and Bastille Day to boycott, and reflect on, the folly that is global capitalism. 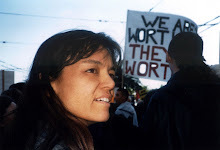 Others have already manifested ideas into movements. There's the Take Back Your Time movement, the Slow Foods movement, the Simplicity movement, the Small House movement , the Organic Food movement, the Locovores, the Freegans, the Permaculture people and the Relocalization movement. There's Buy Nothing Day, Buy Local Day, Reverend Billy and the Church of Stop Shopping and The Compact—those who pledge to buy nothing new (save for socks and underwear). You would think we had reached a critical mass by now, but it's possible that the same handful of people is participating in all of these groups. Or maybe we're just a seed bank of ideas being preserved for the day that the world realizes there is no such thing as sustainable growth. The day that we all look around at an even more paved over and polluted planet and think this is not what we had in mind. Where did we go wrong? Could we have done something different?